Bathroom Medicine Cabinet of 23-5/8" High x 11-7/8" Wide x 6-7/8" Proj. As a rule, in a bathroom, sink is always paired with a medicine cabinet. But this can be a problem, if you've installed a corner bathroom sink. 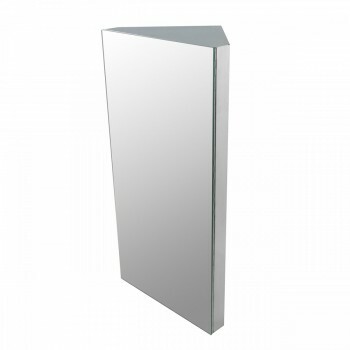 We, at Renovator's Supply, have the perfect solution for you with our corner medicine cabinet.Regardless of the fact that your sink is set right across the corner of the room or quite close to it, we offer you plenty of choices in picking up a design, best suitable for your requirement.A corner medicine cabinet is the two-faced snoopiest thing you can do. Apart from giving multiple uses, it also can be used as a fun and decorative piece for your powder room.For people having small bathrooms, space becomes a major concern. By installing our medicine cabinet, these home owners can make use of considerable amount of space in other treatments.To top it, we've also installed a superior quality mirror to increase its usability.